There have of course been more changes in the Australian pump landscape since my November update. So here’s a new run-down. The consumables for the above pumps are available through NDSS. As usual I’ll run through them all with brief descriptions. Then I’ll mention other pumps we’re aware of which are not available. For new pumps to be available in Australia, the first hurdle they need to pass is registration with the Therapeutic Goods Administration (TGA), after which doctors and suppliers are legally allowed to talk about them. The next hurdle is generally getting listing on the Federal Department of Health’s Prostheses List so they’re eligible for supply by health insurance. The Prostheses List is updated in February and August each year, with the updates coming into effect in mid-March and mid-September. A note about “closed-loop” systems, those are systems which use your CGM data to dynamically adjust your pump’s delivery of insulin. 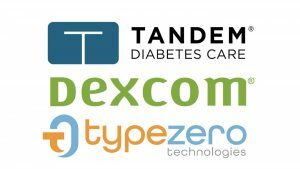 These are not the mythical complete “artificial pancreas” replacement, but they do add a lot of automation to help you manage your diabetes. For information about the open protocol closed-loop systems, see my separate page on the Australian options. The following pumps are available new. Usually they’re bought through private health insurance, where they’re classified as prosthetic devices. With Australia’s updated health insurance tiers, they’re covered under Gold-level policies, plus many insurers are also covering them at lower levels (some still cover them under Bronze-with-extras). Check with your own insurer as to what their particular policies cover. Unfortunately this is still a developing arena and insurers have up until April 2020 to restructure their policies to fit the new system. Some changed in April 2019, some will update in July. The 670G pump is Medtronic’s first closed-loop system. 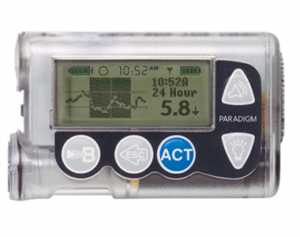 The pump acts as the receiver for the Guardian3 Link CGM, which it needs for the closed-loop functionality. The reservoir in the 670G can hold up to 300U of insulin (it can also use a 180U reservoir), and the basal rates can be set to 0.025 U/hr increments in 30-minute blocks. The 670G is not compatible with any external closed-loop systems. With its CGM the 670G is able to have the same SmartGuard function as the 640G, as well as having “auto mode” which is their closed-loop system. Note that it is a first-generation looping system and lacks many of the configuration options and features of the open protocol loop systems, although it is approved by the regulators and available without you having to assemble it yourself. Like all loop systems it needs “care and feeding”: hopefully people don’t assume it’s going to be a “magic pill” which will fix everything for them automatically. This pump is a relatively old design, but it has proven itself as a reliable performer over the years. The Combo system is comprised of a “Spirit Combo” pump with a “Performa Combo” BG meter which is used as a remote control so the pump doesn’t have to be brought out of your pocket in normal use. 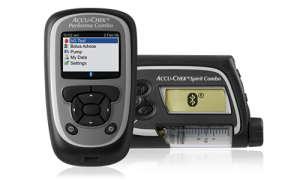 The Spirit Combo can hold up to 315U of insulin, and the basal rates can be set to 0.01 U/hr increments in 1-hour blocks. The pump has a luer-lock connection for its infusion sets, so it can be used with any of the Roche/Accu-Chek sets along with the Unomedical (“Animas”) infusion sets, the Cleo 90 and Medtronic’s Quick-set. This pump is a small pump with a touchscreen interface. The aluminium case is very robust, and gives it a slight heft in your hand. The internal battery is recharged by USB (typically topped up daily). The insulin reservoir can hold up to 300U. The basal rate can be set with a tiny increment of 0.001 U/hr in 16 arbitrary time blocks. Currently two different reservoirs are available for the pump. One has a luer-lock connector, the other uses Tandem’s t:lock. The luer-lock reservoirs will be discontinued at some point. The luer-lock connector works with the same Unomedical infusion sets used with the older Animas pumps (along with the Accu-Chek sets for the Combo pump described above, the Cleo 90 set, and some of Medtronic’s older sets). 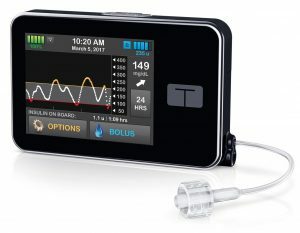 The t:lock connector works with Tandem’s new infusion sets, which are the same as the older Inset, Comfort, and Contact sets except for that connector and their new names (AutoSoft, VariSoft, and TruSteel). Note that Apidra insulin is not compatible with the Tandem reservoirs (it’s not officially listed for pump use in Australia, but is sometimes used in other pumps). 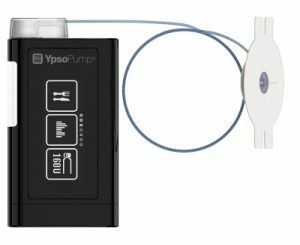 A feature of this pump is the ability to update its firmware at home via USB without having to have the whole pump replaced/serviced, and this will be used to add features to the pump during its 4-year warranty period. Right now the pump can act as a Dexcom G5 CGM receiver. 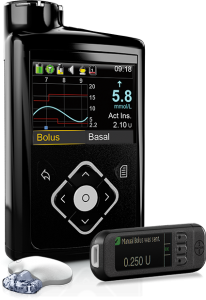 When the Dexcom G6 is introduced to Australia (probably in 2019) the firmware will be updated to support G6 along with Tandem’s “Basal-IQ” low-glucose-suspend function. This suspends and resumes basal insulin as required to keep your BG above 4.4 mmol/l. It was released to US users in August 2018, and has received a lot of positive feedback. Tandem are still testing the subsequent “Control-IQ” firmware update, which is their closed-loop pump control system, working to keep your BG in range all the time. Many people are understandably excited about this. Do note that there is a lot of work still to be done to get it through the US and Australian regulators and bring it to market. Tandem have indicated it might be late 2019, but we’ll have to wait to see how good that estimate is. AMSL have stated that both the Basal-IQ and Control-IQ updates will be free in Australia (although users will presumably need to go through additional training and have medical signoff to receive the update). The t:slim X2 is rated as IP67 waterproof, which is not quite as robust as the IPX8 rating of most other current pumps. See this article for a discussion of waterproof ratings. Mind you, the IP67 rating does still allow for short-term immersion in water up to a metre deep. The reservoir holds up to 160U of insulin, and the basal rates can be set to 0.01 U/hr increments in 1-hour blocks. The pump uses the Orbit infusion sets (with steel and teflon options) although more options may be introduced at some point. The reservoir is smaller than in some other pumps, although 160U is enough for many people’s requirements. Plus the reservoirs are glass (unlike the plastic of other pumps) and as such are approved for longer-term insulin storage. The tested and approved use includes the ability to pre-fill reservoirs and keep them in your fridge for up to 4 weeks. 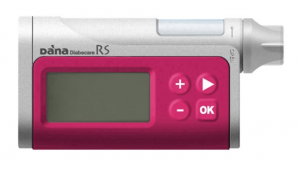 The DANA RS has a 300U insulin reservoir, and basal rates can be set to 0.01 U/hr increments in 1-hour blocks. It uses DANA-specific infusion sets (including a teflon one made by Ypsomed and equivalent to the OrbitSoft set). The special batteries for the pump are supplied in each box of reservoirs. While not available new, the following pumps are still in use by many people. This pump originally integrated with Medtronic’s Guardian2 Link CGM, but also supports the Guardian3 Link that was introduced with the 670G. It uses that data for “SmartGuard” which is their predictive-low-glucose-suspend (sometimes referred to as a “hypo minimiser”) although this function is dependent on keeping the CGM calibrated and accurate. The pump is supplied with the same BG meter as the 670G, and the reservoir capacity and consumables are the same. These were Medtronic’s previous generation of pumps. The reservoir in the 554 can hold up to 180U of insulin, and the 754 can hold up to 300U (or use the 180U option). The basal rates can be set to 0.025 U/hr increments in 30-minute blocks. The pumps support Medtronic’s old “Enlite” CGM system (uses the same sensors as the Guardian2 CGM, but a different transmitter) and they have a primitive low-glucose-suspend function (which suspends when you get to the boundary point, not when the pump predicts you’re soon going to get there). These pumps were originally rated with IP67 dust/waterproofing, but especially given their age I would not regard any of them as waterproof today. The latest firmware versions of these pumps are not compatible with any open protocol closed-loop systems. 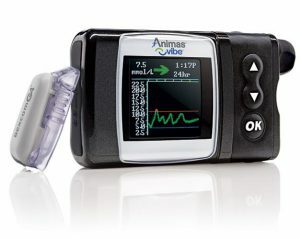 Older versions with firmware up to 2.7A are “loopable” and supported by both the Loop and OpenAPS closed-loop systems. As are many other older Paradigm models. 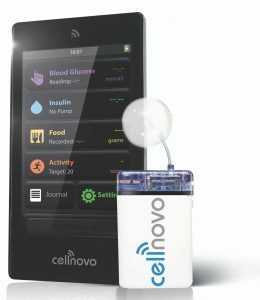 The Cellnovo system has recently collapsed, with the manufacturer going into administration and shutting down. No new pumps or consumables are being produced, and the Australian distributor is working to transition all users to other systems by July 2019. The tiny pump was worn on the body next to the infusion site, and could hold up to 150U of insulin. The cannulae (both steel and teflon options) are the same as those for the Ypsopump’s Orbit sets. Like Cellnovo, Animas shut down and discontinued their pumps (back in early 2018). But the transition hasn’t been quite so drastic. Pumps with warranty beyond August 2019 are being replaced by AMSL with Tandem t:slim X2 pumps. But for now it’s not unusual to see Vibes in use. The reservoir can hold up to 200U, and the basal rates can be set to 0.025 U/hr increments in 30-minute blocks. The pump has an integrated receiver for the Dexcom G4 CGM system. The Vibe is NOT compatible with any closed-loop systems. This pump looks almost identical to the RS. The main differences are the use of Bluetooth 2 rather than the lower-power Bluetooth LE, and a correspondingly-worse battery life (approximately a third of the lifespan). The DANA R is supported by the AndroidAPS closed-loop system. This tubeless patch pump is available in the US and Europe, but although medically it’s been approved for use in Australia since 2012 it has never been sold here. The economic model simply doesn’t fit the funding model used in Australia. Every 3 days a whole new pump is required: the only permanent piece is the “PDM” remote controller. This would shift most of the cost from your health insurance to the NDSS which supplies consumables, and no-one’s been able to work out a compromise. It also produces a lot of hard-to-recycle waste. Incidentally, the old version’s internal name is “Eros”, and uses 433 MHz radio to link the PDM and the pumps. Their new “DASH” system instead uses Bluetooth but it otherwise the same. I still do NOT expect to see the OmniPod supplied in Australia. This simple mechanical (no electrics) patch pump is designed for daily use by people with Type 2 diabetes, and does not have the flexibility to be suitable for Type 1. I have previously written about the V-Go. This tubeless patch pump is current being rolled out on a limited basis in Europe, and we are hoping to see it in Australia at some point. Like the OmniPod it is already registered with the TGA. The pump has multiple components, starting with a cannula patch (with two length options) onto which the pump clips. 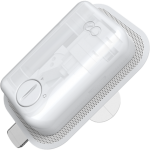 There’s a disposable 200U reservoir which also includes the battery which powers the body of the pump. The pump body nominally lasts 4 months. The Aviva Solo remote controller has an integrated BG meter that uses Accu-Chek’s Aviva strips. The Solo pump is not waterproof: you are expected to remove it (leaving the cannula patch in place) for swimming and showers. This pump is used in Europe, but not available here (although it was registered with the TGA back in 2015, as well as added to the Prostheses List). It uses essentially the same cartridges as the Ypsopump, but the pre-filled Novorapid cartridges used for it in Europe are not available in Australia. The end of the pump is actually part of the infusion set tubing (the pump needs its own collection of infusion sets). I do not expect to see the Insight appear in Australia. This patch pump from Korea got some press in March when it got “Breakthrough Device” designation from the US FDA. However it is still a long way from market. Development plans apparently include integration with the POCtech CGM into a single unit. This tubeless patch pump from China got TGA registration last year, but does not seem to be on anyone’s marketing plans. Reports from overseas users characterise it as a relatively primitive device (especially its controller device). Currently I do not expect to see the Medtrum reach the Australian market. Another European patch pump, Kaleido has a similar form factor to the Cellnovo system, but also allows you to use longer tubing for flexibility in how you wear it. It’s the pump Diabeloop in France chose for their DBLG1 closed-loop system (which did use Cellnovo during development). Currently I do not expect to see Kaleido reach Australia. Hopefully our pump options will continue to evolve over time, so expect an update to this article later in the year. I notice that AndroidAPS 2.2.2 now just added support support for the “accu-check insight” pump as well as the combo. Is that a pump available here ? Thanks for the prompt, I skipped that one. I’ve edited the article to list the Insight amongst the pumps we’re not likely to get in Australia. 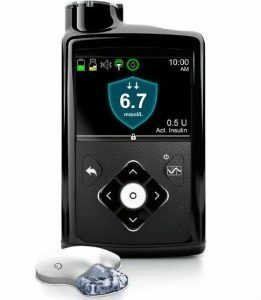 Here’s a goofy question I cannot work out: I’m currently on a 640g with the linked contour glucose monitor – I finger prick, it uploads to the pump, I press some buttons and voila I’m sorted. However I’m considering swapping to the T Slim – what is the equivalent process there? The t:slim X2 doesn’t have a linked meter. Obviously if you’re using the Dexcom CGM the only time you’d need to enter a number would be at the intermittent calibrations (which will not be required when the G6 arrives) but entering numbers is quick and easy for most people via the touch screen. When you bolus it picks up the value from the CGM. Even if you’re not using the CGM it doesn’t take much to enter the number. Thanks David, yep answers it perfectly.